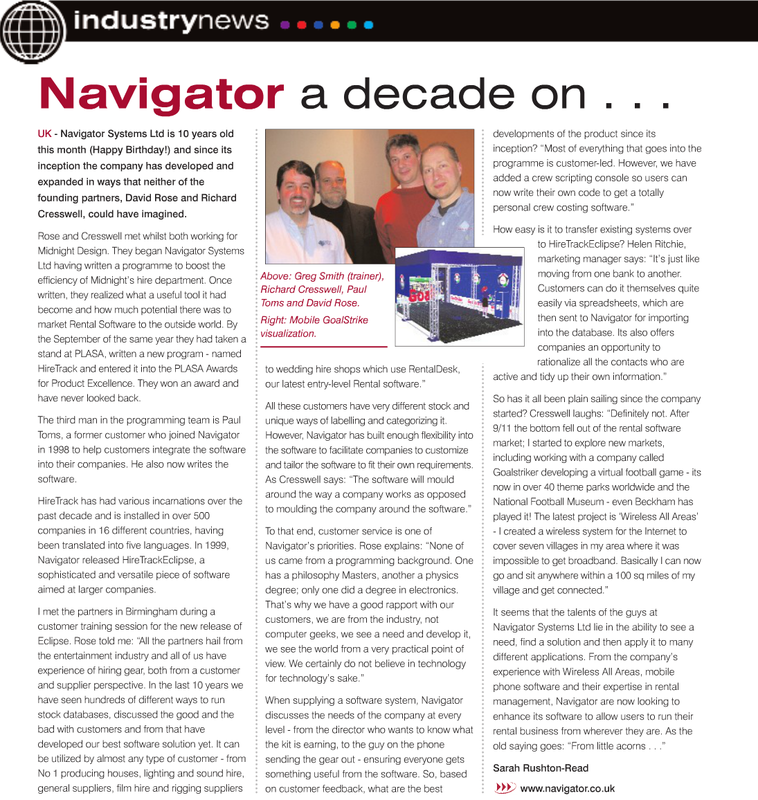 Navigator a decade on . .
UK – Navigator Systems Ltd is 10 years old this month (Happy Birthday!) and since its inception the company has developed and expanded in ways that neither of the founding partners, David Rose and Richard Cresswell, could have imagined. Rose and Cresswell met whilst both working for Midnight Design. They began Navigator Systems Ltd having written a programme to boost the efficiency of Midnight’s hire department. Once written, they realized what a useful tool it had become and how much potential there was to market Rental Software to the outside world. By the September of the same year they had taken a stand at PLASA, written a new program – named HireTrack and entered it into the PLASA Awards for Product Excellence. They won an award and have never looked back. The third man in the programming team is Paul Toms, a former customer who joined Navigator in 1998 to help customers integrate the software into their companies. He also now writes the software. HireTrack has had various incarnations over the past decade and is installed in over 500 companies in 16 different countries, having been translated into five languages. In 1999, Navigator released HireTrack Eclipse, a sophisticated and versatile piece of software aimed at larger companies. Above: Greg Smith (trainer), Richard Cresswell, Paul Toms and David Rose. Right: Mobile GoalStriker visualization.